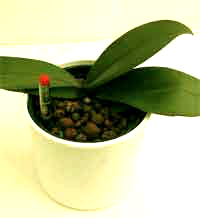 Phalaenopsis are good candidates for transplanting to Hydroponics. 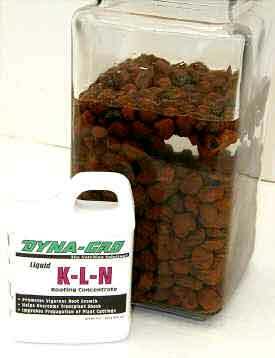 Although spring to early summer is the best time to convert to Hydroponics, any time of the year will work. If your plant is flowering, we recommend waiting until the flower cycle is finished before transferring. 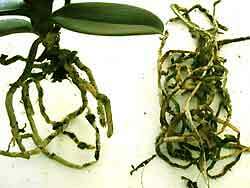 Phalaenopsis are planted in many different types of growing media. That makes it impossible to judge how often to water if you're a beginner. Plants in moss stay wet and need water only once every 2 weeks. 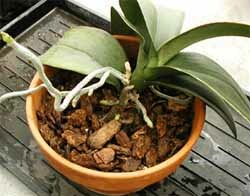 On the other hand, the same plant in bark will probably need water twice a week! Sphagnum moss is a favorite of many commercial growers. It stays wet too long (sometimes more than 2 weeks!) and breaks down quickly. This is a spongy, peat moss mix that is very inconsistent in its watering needs. This plant is growing in a is a bark mix. In the beginning it may need water twice a week. As it ages and deterirates (9-12 months) it compacts and turns to mush. Eliminate that stuff! Both you and your plants will appreciate our clean ceramic pebbles. 2. 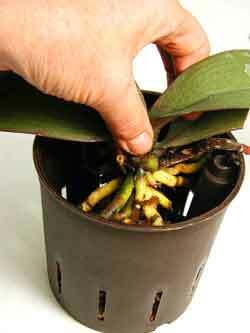 Using both hands, carefully remove plant form grow pot. 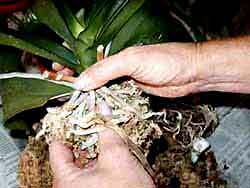 Sometimes roots attach themselves to the side of the pot, especially clay pots. 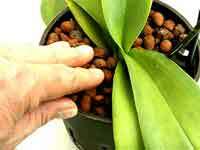 If this is the case, carefully break away existing grow pot without damaging the plant's roots. 3. 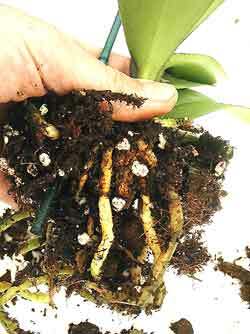 Remove ALL POTTING MATERIALS from the roots. If you accidentently damage some roots just cut them off. 4. 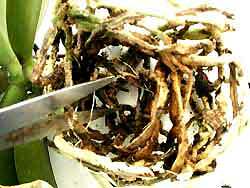 Trim away all damaged or deteriorating roots. Healthy roots are flesh colored and plump. Cut away everything else. Be aggressive! 5. The left side of this photo shows the good roots after trimming. The discarded roots are on the right. Sometimes it's necessary to remove almost everything! 6. 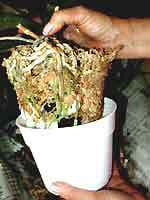 Wash remaining roots thoroughly, removing all potting materials. This should be pretty easy after all the old roots have been trimmed away. 7. Fill culture pot 1/4 with pebbles from rooting solution. Arrange roots on pebbles base. Holding plant in position, add more pebbles to fill pot. 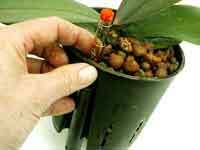 Plants in Hydroponics should be planted slight deeper than traditional mixes. 8. Tap pebbles down for stability. Correct planting depth is important. If plant is too high or wobbly, dump out everything and start over. 9. Insert water gauge and place culture pot (and plant) into outer decorative container. 10. There's your new plant - happy in its new home! Congraduations! 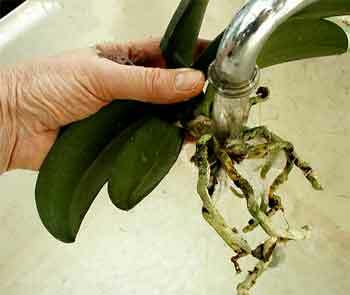 You've just repotted your Phalaenopsis Orchid into hydroponics.